I thought the story was written by Trudi Canavan, but apparently I was wrong. It was a book or maybe a series of book. I think I’ve read it 5-15 years ago in Germany. Not sure when it might have been published. Not sure whether I read it in English or in German. The story was about a girl (or boy?) whose parents came from different sides of the mountains, which was a forbidden union according to the powers that be (see below). The character travels the (forbidden) path to the castle in the mountains, where magicians allegedly live, seeking their father. I think that the castle was actually a training academy for magicians. It turns out that some of the magicians can transform into dragons or are actually dragons, depending on some combinations of recessive alleles in their genome. The exact genetic circumstances are only revealed towards the end of the story. This is what fascinated me about the story: that mystical “some magicians are dragon” theme actually had a (more or less) scientific basis the whole time, but the knowledge of that had been completely lost to the characters at the time the story took place. The “dragon-magicians” ruling the land divided the human population into two groups with different genes and forbid any interaction between these groups, such that new dragon-magicians could not be born. (I think this was revealed fairly late in the story). At some point the main character is also revealed to be a dragon-magician, I think (due to their special heritage of two different peoples, see above). Transforming into a dragon for the first time in your life was a risky process, as there was a danger of losing your human consciousness and essentially becoming a (highly dangerous and magical) animal driven by instincts. Thus the first transformation was usually performed in some kind of specialized magical prison cell for dragons. However, the “dragon-magician” population has declined for some reason and there are very few left. One of the remaining few dragons has gone mad, but regains their sanity due to something involving music. I believe it had to do with the main character playing an old/forgotten melody on the flute. There was also a time-travel episode into a time when the dragon society was prospering. During that time, the mad dragon wasn’t yet mad but already loved/played music. As per Trying to remember a book involving a girl from a distrusted race becoming a mage and a dragon, this is probably First Truth by Dawn Cook. The book's protagonist (Alissa) gradually learns to shapeshift into a being called a raku, basically a dragon. Alissa doesn't believe in magic. Her father's stories about the Hold, a legendary fortress where human Keepers learn magic from the enigmatic Maters, are just that―stories. But her mother insists that Alissa has inherited her father's magical ability, and so she must go to the Hold―the only place her talents can be trained. On her way, she crosses paths with Strell, a wandering musician from the plains. And though Alissa is not sure she can trust a plainsman, Strell has something she needs―one of her father's old maps. Travelling together, they can reach the Hold before the snow sets in. But they don't know that the Hold is nearly empty. Something is very wrong and someone believes that Alissa and Strell knows about a book called First Truth. It is a series of four books. The third book, Forgotten Truth, has the time travel as well as further exploration of the change risking losing one's personality. 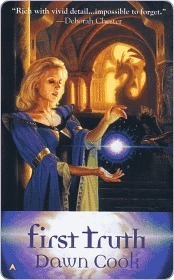 Apt and eager Alissa is the only student of the last surviving master of magic. She easily shifts from human to raku, or beast counterpart, and has learned many advanced magics on her own. One afternoon, a tiny miscalculation sends her back in time 400 years within the Hold in which she lives. Now it is peopled by names and faces from stories the master has told of his and the Hold's history. As Alissa and a new, young teacher search for how to send her back, another problem arises: the primal living force behind her raku form is surfacing more often and without summoning. It is just a matter of time before Alissa will be overcome. Her transformation to raku will be permanent. It will be as if she had never existed. Fantasy book where two magicians travel to many worlds while being chased?